Ireland Is Tearing Down Thousands of Empty, Brand New "Ghost Homes"
Phoenix, Madrid, even Astana: These are the cities we tend to hold up as examples of the havoc that construction booms—and busts—can wreak on a housing market. Ireland is in the news less, but its situation is just as dire; thousands of brand-new Irish homes have sat empty for years. And now the government is demolishing them. According to the BBC, as many as one in five Irish homes is vacant. This glut of housing is a symptom of the truly gigantic building boom that hit Ireland in the early 2000s, when speculative housing projects popped up in droves. But just a few years later, as the global financial crisis took hold, it became clear that the demand just wasn't there. In 2006, economist David McWilliams named these developments "ghost estates," and the name has stuck. Some of the many empty newly built apartment buildings stand with their exterior window shutters closed in Sesena, Spain. Images: Jasper Juinen/Getty Images. Today, people who did buy new homes are out hundreds of thousands of dollars, and more that 600 new developments across the country are abandoned. Many of these homes are poorly built—all but uninhabitable, even if the buyers were there—and some are dangerous: The New York Times reports that a two-year old wandered into one construction site this year and drowned. A similar situation developed in Spain, where thousands of units of new housing still sit vacant. Spurred by stories like these, Irish officials are going to unprecedented lengths to fix their mistake, opting to demolish the brand-new homes—focusing on the ones that have construction deficiencies. According to the NYT, the government plans to raze at least 40 developments by the end of 2014. Bulldozers will pull down hundreds of homes, symbolizing the grim reality that the market for these luxury suburbs never existed, and never will exist. 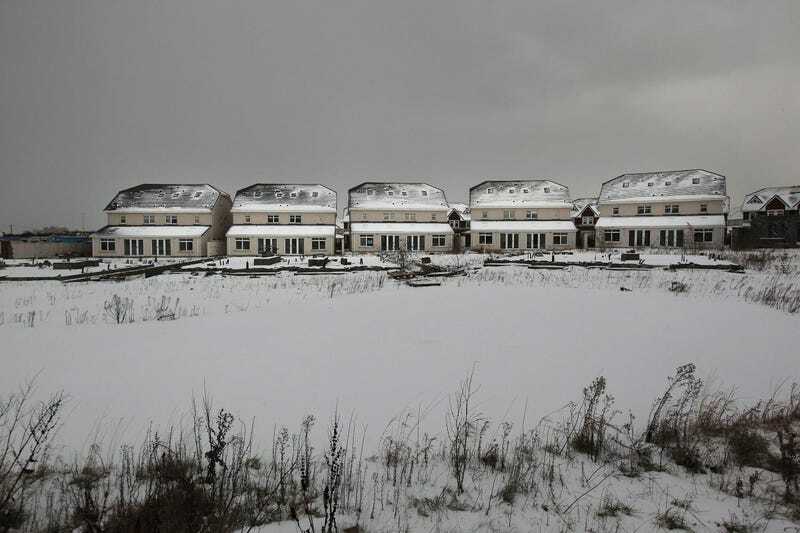 Houses stand vacant in the Castlemoyne development in North Dublin, Ireland. Image: AP Photo/Peter Morrison. Are there other options? Possibly. One Detroit nonprofit recently started offering vacant homes to writers and artists in an effort to revitalize nearly empty neighborhoods, though the effects of such projects are untested. Another project, in Cleveland, turned an abandoned home into a solar greenhouse. Other cities are toying with ideas like turning empty units into homeless shelters, storage spaces, or shared workshops. Can Giving Free Houses to Writers Help Revitalize Detroit? Only a 45-minute drive from downtown Madrid, towering vacant apartment blocks loom over empty streets and weed-filled lots. Apartments galore are for sale and rent, and prices are plunging. Photo: AP Photo/Paul White. Lead Image: Unsold houses lie next to land bought for development at the Castlemoyne housing estate on December 1, 2010 in Dublin, Ireland. Peter Macdiarmid/Getty Images.